It is strange that we've just recently received this promo CD as this album was release back in October, 2003. Up From the Ashes is the third album from Gothic Knights. Gothic Knights is a label mate of fellow power metallers Cryonic Temple, whose new album you read about last week. There is nothing new or original about Cryonic Temple's brand of power metal, yet they play their music with inspiration, emotion, and plenty of technical flair. Gothic Knights is also not original or anything we haven't heard before, yet the music sounds very prototypical and lacking of personality. Up From the Ashes starts on a very bland, "heard it before" pattern, but the songs do improve slightly as the album progresses. Unfortunately, things never pick up enough for me to get excited. 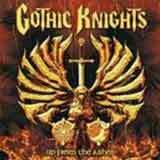 There are no glaring mistakes on the album, and you will hear that the music of Gothic Knights is well executed and well produced. From what I have read about this band, there were many complaints about the lead vocalist on the debut Gothic Knights album (he did not appear on the band's second album). Well, the man must have made some notable improvements since the debut, because he does a good job on Up From The Ashes. He easily carries a melody, and he does an excellent job hitting and sustaining the high notes. His performance certainly is not enough to elevate Gothic Knights to the next level, but he does make for an enjoyable listen. Musically speaking, I find almost nothing memorable on this album. The arrangements are standard fare, while the riffing is predictable and equally uneventful. The solos are decent, but again, nothing to get excited over. The drummer is tight, able to keep a blazing fast pace, and never misses a beat. But, as you can probably guess, the drum work also follows a set pattern; lacking in creativity. I'm not saying that the musicianship is poor. That is certainly not the case. The entire album will pass without angering you with mistakes (I couldn't find any), but it will also failing to impress you with creative songwriting and interesting musical elements. As we all know, the power metal genre is not exactly small these days, so it will take more than well executed and produced music to make an impact on listeners. Devoted fans of power metal who never tire of this type of music will enjoy this album the most. There is really nothing wrong with the individual performances on Up From the Ashes. For everyone else, I truly believe that this album will fail to impress. I must admit that I am a big fan of power metal, but the ever increasing size of the power metal field is making me much more selective when it comes to my listening time. As a result, average sounding albums such as this album are pushed to the back burner.